Milky Way galaxy and Milky Way Drive Somewhere in Arizona, I think. 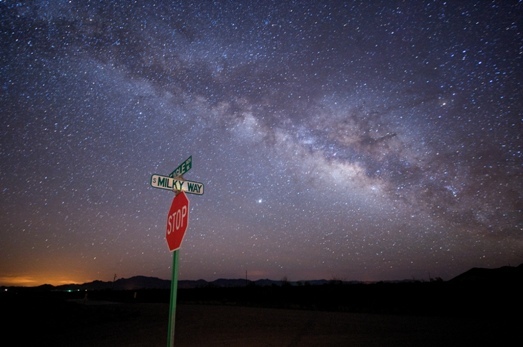 Maybe I can retire to Milky Way Drive- I think that would be a good address. Andromeda Nebula From a dark place in the fall, you can see (with your naked eye) a fuzzy football-shaped patch of light in the constellation of Andromeda. This is the Andromeda Nebula or more accurately, the Andromeda Galaxy. Andromeda photo using small telescope In the 1920s, Hubble found Cepheid variable stars in the Andromeda Nebula. 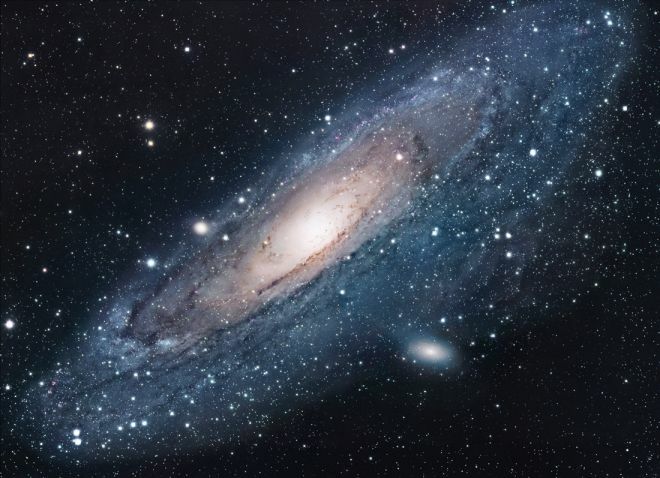 Using the brightness of these stars, he found that Andromeda Nebula is in fact about 2 million light years away from us and is an entirely separate galaxy, similar in size to the Milky Way, rather being something IN the Milky Way. Local Group of Galaxies This is our immediate galactic neighborhood. The Milky Way and Andromeda are two large spiral galaxies, about 2 million light year apart. Most of our galactic neighbors are small dwarf galaxies. (1) Faceon or top view of a spiral galaxy (2) Side view of a different spiral galaxy The first image is a photograph taken with a telescope of a spiral galaxy that is seen "face on". You can easily see the spiral arms. 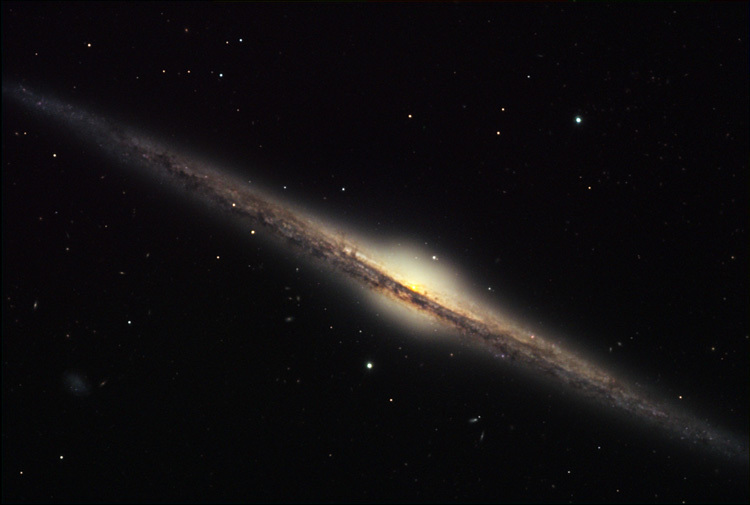 The second photograph is of a different galaxy that is seen almost edgeon. The dark ring is dust in the disk of the galaxy, which blocks some starlight. You can easily see the "halo" as a big, almost round soft glow of light. This glow is from many individual stars that are to dim to be see individually. You can see some individual bright dots in the halo- these are globular clusters. Because of the angle, it is hard to make out the spiral arms in the disk. These images, of course, are of TWO DIFFERENT galaxies. We can't "tilt" a galaxy over so can see it from a different view, nor can we move ourselves around the galaxy to see it from a different angle. 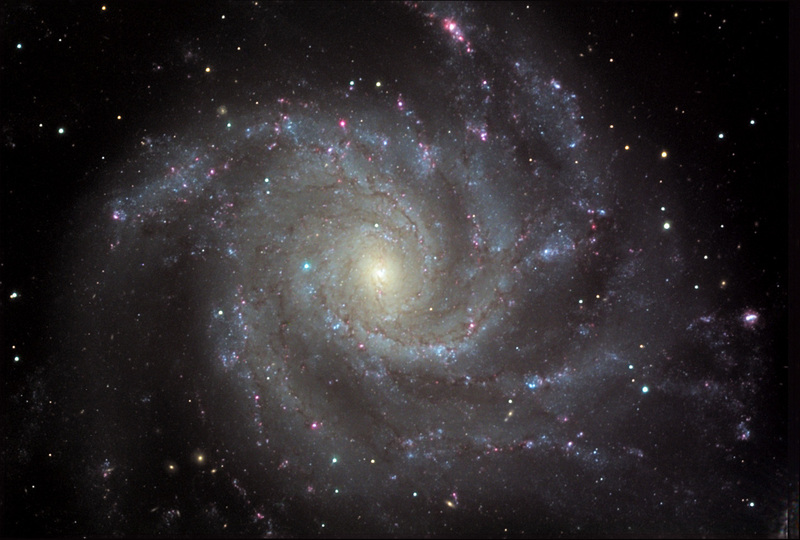 Another spiral galaxy An edgeon spiral galaxy I could show pictures of galaxies all day long! There are thousands and thousands of galaxies that are close enough for us to get detailed images like these. However, there are billions of galaxies that can be seen simply as dots of light using very large telescopes. 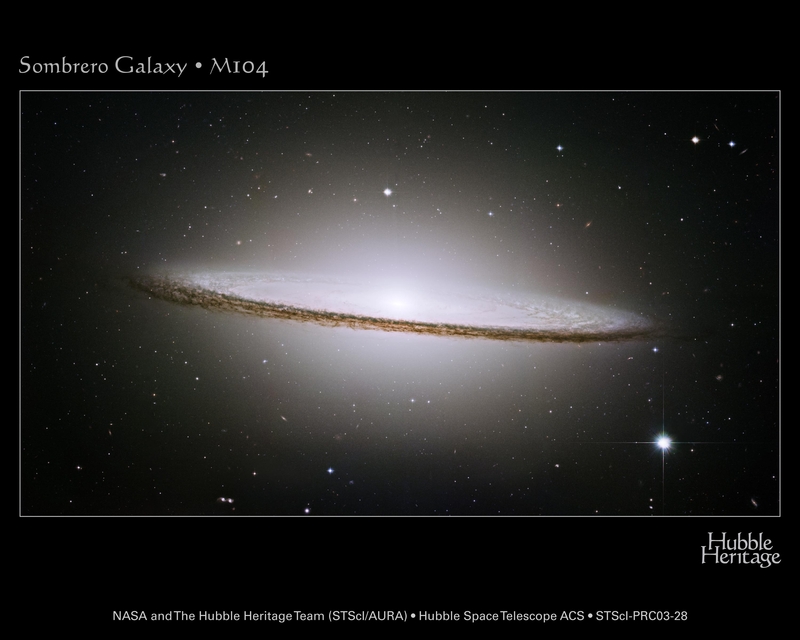 An elliptical galaxy Hubble found that galaxies come in two main types- spirals, which have lots of young stars, as well as old stars, and ellipticals, which have ONLY old stars. 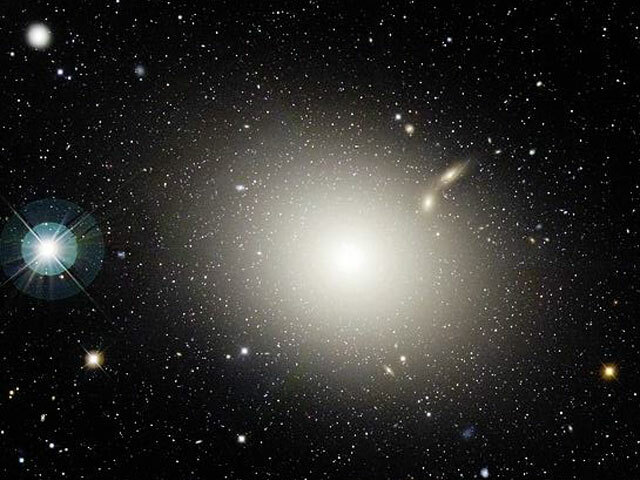 This photo is of a giant elliptical galaxy, larger than the Milky Way. The bright dots are not individual stars, but are globular star clusters. 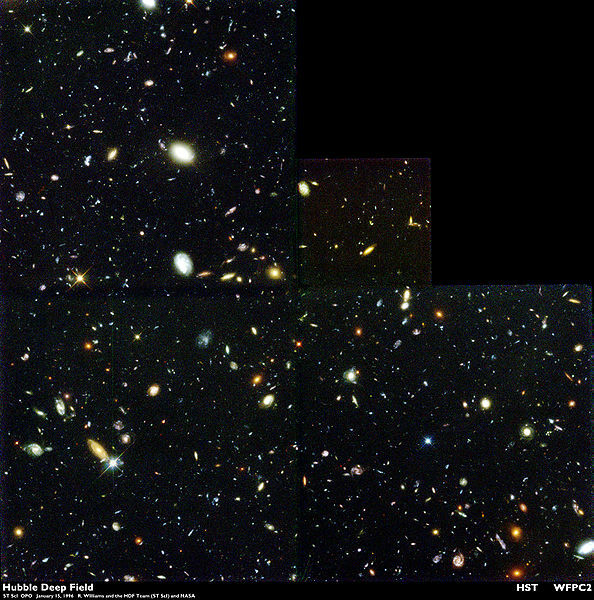 (1) Hubble Deep Field (low resolution image) (2) Hubble Deep Field (high resolution- big file!) 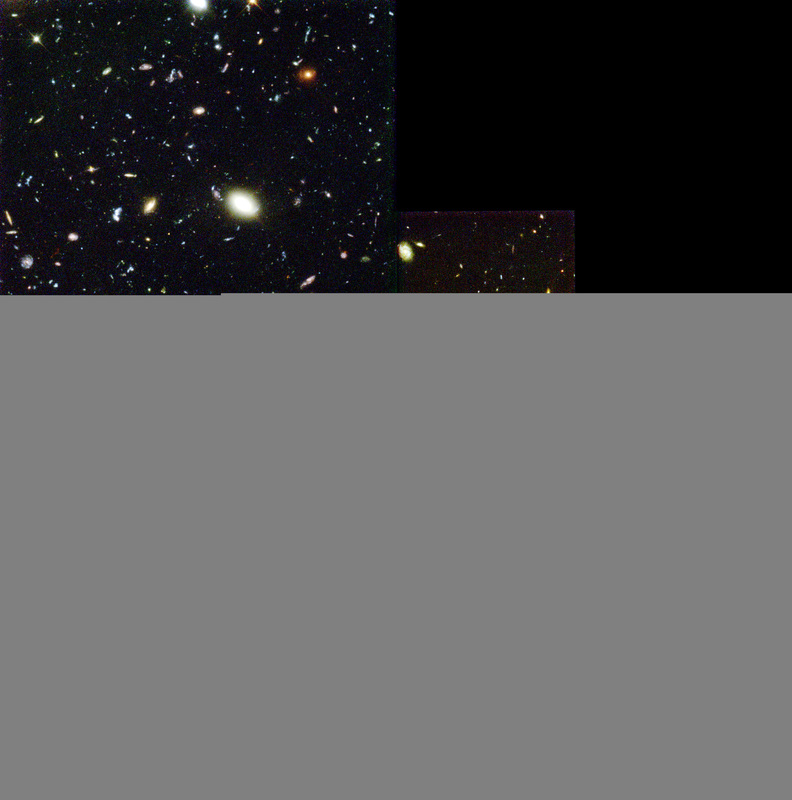 The Hubble Space Telescope was used to stare at a tiny peice of the sky for a several week-long time-exposure to get the "deepest" image of a small piece of the Universe we have. Almost every discernible spot of light on this image is a galaxy. Some are seen with some detail (the "nearby" one- only a few 10s of millions of light years from Earth), while some of the "specks of light" are galaxies that are billions of light years from us! To image the entire celestial sphere to this level of detail would require thousands of years with Hubble. 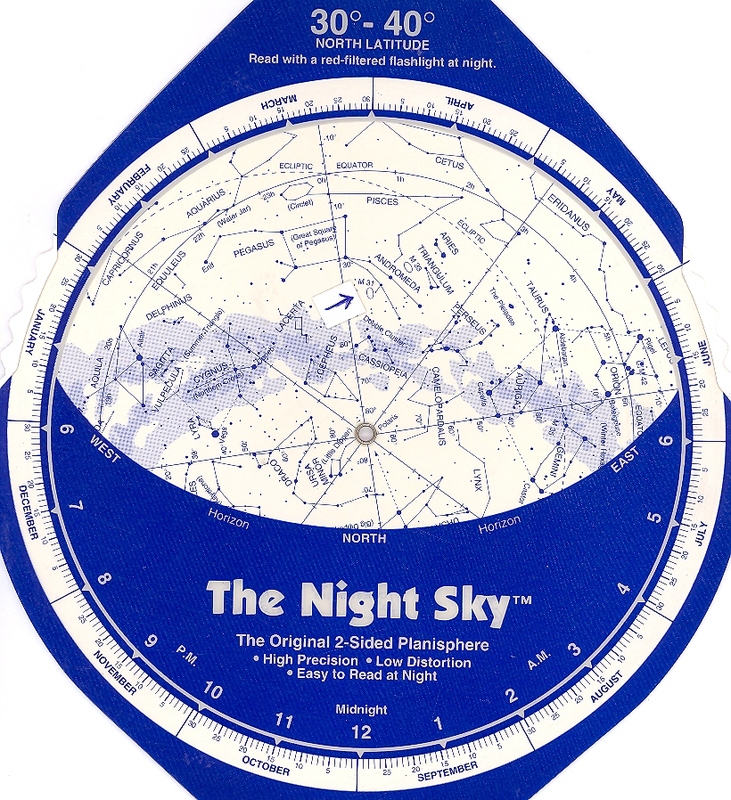 From this typical piece of sky, we can estimate how many galaxies we would see if we did image th entire sky. The answer is several hundred billion (with a "b") galaxies!! 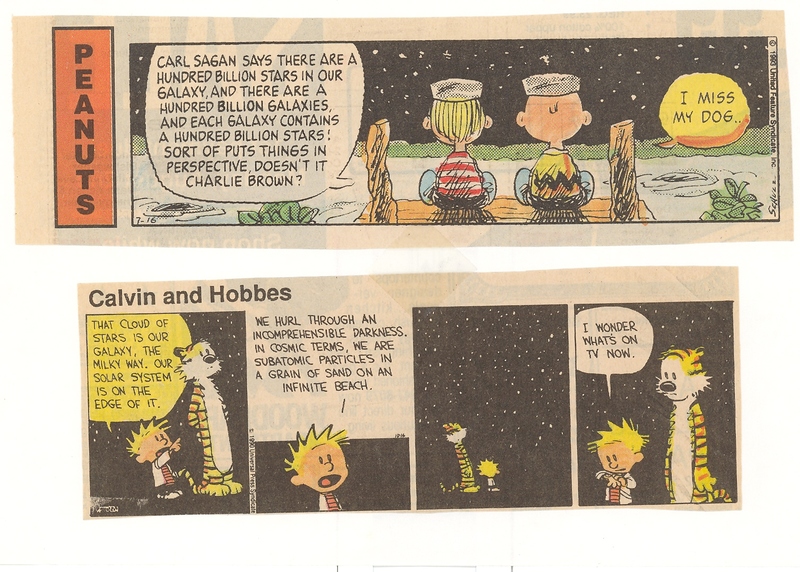 Charlie Brown and Calvin and Hobbes contemplate the Universe Thinking about the size of the Universe can be a bit overwhelming! 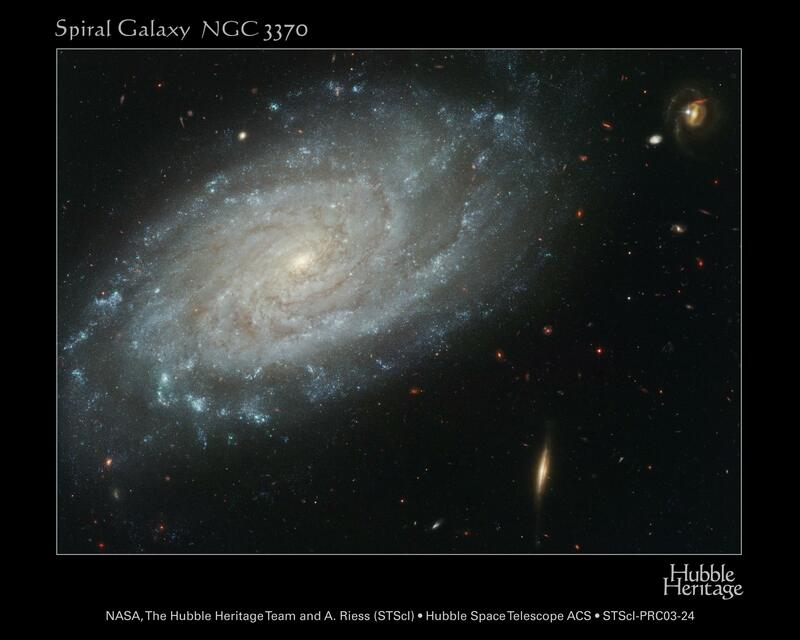 Hubble Law Hubble showed that the farther away a galaxy was from Earth, the faster it was moving away from us. We measure the speed of a galaxy using the Doppler shift. In this diagram, the pictures are all of similar types of galaxies (giant ellipticals). 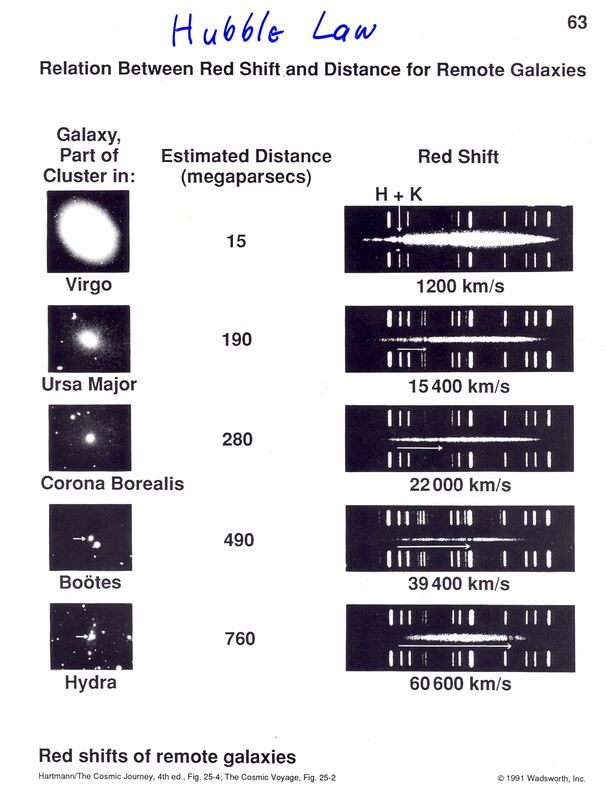 As you go down the page, the galaxies are farther away from us (they look smaller, but all have about the same actual physical size). 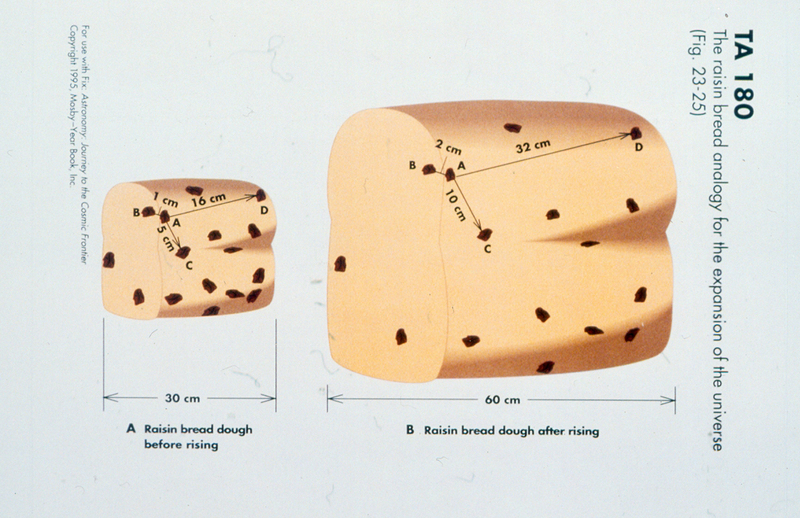 Raisin Bread analogy of uniform expansion of space If space is expanding uniformly, that is every part of it is increasing in size at the same rate, then beings on ANY galaxy would see all other galaxies moving away from them, and the farther ones would be moving FASTER, as there is more space to expand between the observer and a distant galaxy. Thus, the uniform expansion of space leads to the Hubble Law. If we "run the movie backwards" we see that all the stuff in the universe would have been at one place some definite time in the past.